Cyclamen is a small but diverse genus of plants. Many species are hardy, generally in USDA Hardiness Zones 7 and above. Cyclamen persicum, or florist’s cyclamen, has sweet-scented small (1/2 to 3/4 inch) flowers that are produced on long stems, held upright above the foliage. It is a tuberous perennial with heart-shaped leaves and flowers in shades of pink, red, or white. Even the foliage is attractive, often having silver marbling on the top sides of the leaves. These colorful houseplants are especially popular during the winter holiday season, when you can find them blooming on shelves in garden centers and even grocery stores. The entire plant, when in flower, reaches only about 8 inches high. Cyclamen can bloom for weeks and require very little care. Cyclamen are usually grown in pots indoors. They go dormant for the summer but with proper care, they will re-bloom in the fall. Exactly when they go fully dormant depends on their growing conditions. If they are houseplants and the heat is kept high, they’ll peter out more quickly. On the other hand, some don’t ever appear to go fully dormant. When grown outside, Cyclamen persicum will bloom in late winter or early spring. Greenhouse cyclamen are usually forced into bloom sometime around the holiday season into late winter, but their natural bloom period is earlier. Give cyclamen bright, indirect light in the winter when they are actively growing. 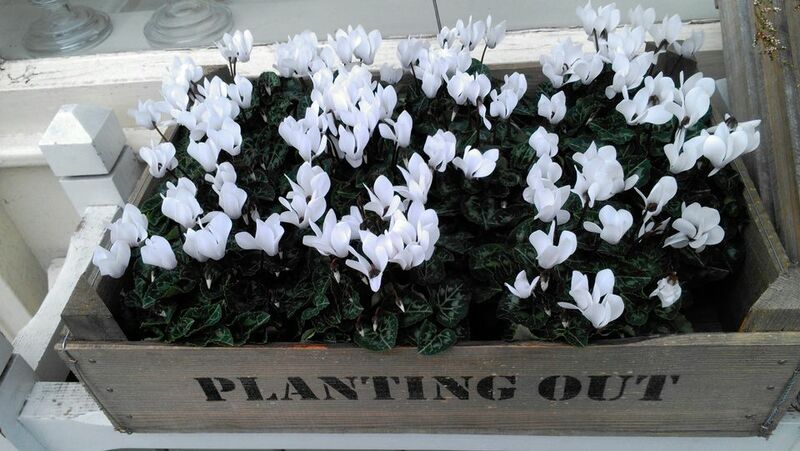 In summer, it is best to keep cyclamen in a cool, dark spot with good air circulation. You can also move it to a shady spot outdoors in summer. Just make certain it is not getting too much water. Cyclamen persicum does best when planted in a soilless-based potting mix, with the top of the tuber just slightly above the soil line. When leaves are present, the plant is actively growing. Water whenever the soil feels dry about an inch below the surface. Avoid getting water on the crown of the plant which could cause it to rot. As the flowers begin to fade, gradually allow the plant to dry out for two to three months. It is going into a dormant stage and any excess water will cause the tuber to rot. If you put it outdoors during dormancy, be sure to turn the pot on its side to keep the rain out. A little water is not harmful, but you don’t want the soil to remain wet. Cyclamen do not like extreme heat, drafts, or dry air. They do best in a climate that replicates their native environment, between 50 degrees Fahrenheit and the mid-60s. High humidity, especially during winter, is crucial. Keep the cyclamen on a tray of water with a layer of pebbles or gravel to form a shelf for the cyclamen pot to sit on. Do not let the bottom of the cyclamen pot sit submerged in the water or the roots will rot. If you moved your plant outdoors for the summer, bring it back indoors before the weather turns cold. A good rule of thumb is to bring it inside while the temperature is still comfortable for you with the windows open. Feed your cyclamen plant with a diluted liquid low-nitrogen fertilizer every couple of weeks while in full leaf. You do not need to fertilize cyclamen while it is dormant. Cyclamen should be repotted every two years. You can re-pot while the plant is dormant, in the summer, with fresh soil and a slightly larger pot. Fill the new container part way with potting soil. Lift the tuber out of the original pot and brush off the old soil, but don't rinse it. Place the tuber in the new pot so that its top is about one inch from the rim. Cover it halfway with potting soil. Place the pot in a shady, dry spot for the rest of the summer. Start watering it around September and you should start to see new growth emerging. There are many wonderful cyclamen hybrids available and since they stay in bloom for a long period, you can choose your plant while the flowers are open and know exactly what you are getting. Although festive and lovely, cyclamen can cause digestive problems for pets that like to munch on plants. Keep them out of reach of dogs and cats.